The Colorado Potato Beetle surfaced in my garden today. Three adults were found and numerous larvae and eggs. Control is by picking and destroying all, usually several times a day. A large infestation requires the application of chemicals. The beetle cannot be ignored, since they multiply rapidly and can destroy a potato crop in a few days. The bug is ubiquitous and few gardens are without them in Canada. 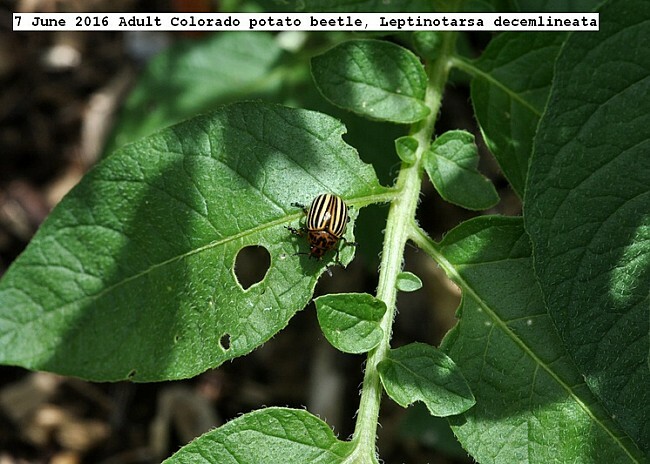 This entry was posted in Uncategorized and tagged 7 June 2016 Colorado potato beetle, Colorado Potato Beetle, Leptinotarsa decemlineata. Bookmark the permalink.